In Java, objects are manipulated through reference variables, and there is no operator for copying an object—the assignment operator duplicates the reference, not the object. The clone() method provides this missing functionality. In this article, we look into the basic of cloning in Java and types of cloning such as shallow and deep cloning. Also, it disadvantages and what are the alternative approach to do the cloning in Java. Java does not provide an automatic mechanism to clone (make a copy) an object. Recall that when you assign a reference variable to another reference variable, only the reference of the object is copied, not the content of the object. You need to observe few things about the declaration of the clone() method. It is declared protected. Therefore, you will not be able to call it from the client code. The following code is not valid:Object obj = new Object();Object clone = obj.clone(); // Error. Cannot access protected clone() method.This means you need to declare the clone() method public in your class if you want the client code to clone objects of your class. You do not need to know any internal details about an object to clone it. The clone() method in the Object class has all the code that is needed to clone an object. All you need is to call it from the clone() method of your class. It will make a bitwise copy of the original object and return the reference of the copy. One important thing that you must do is add an "implements Cloneable" clause in your class declaration. Cloneable is an interface declared in the java.lang package.Otherwise, you will get a runtime error when you call the clone() method on the objects of your class. From Java 5, you need not specify the return type of the clone() method in your class as the Object type. You can specify your class as the return type in the clone() method declaration. This will not force the client code to use a cast when it call the clone() method of your class. You should not create a new object using new. The proper way is to call super.clone() for a new instance. Object's clone() is special and will create a new copy of the object and copy its primitive fields and references. An object may be composed of another object. In such cases, two objects exist in memory separately—a contained object and a container object. The container object stores the reference of the contained object. 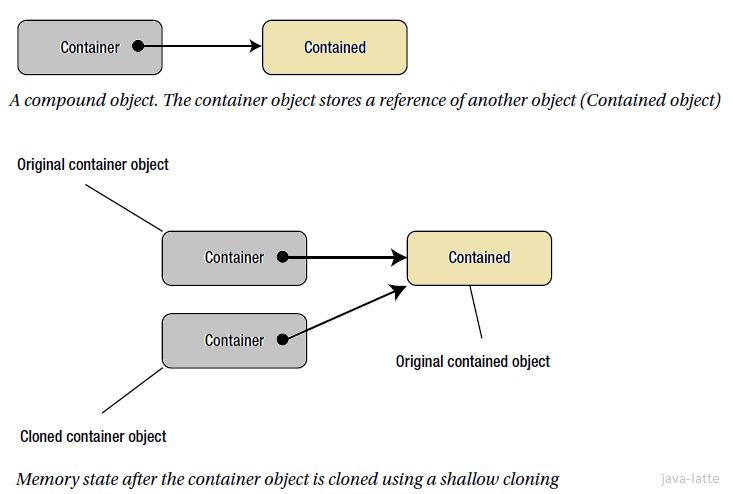 When you clone the container object, the reference of the contained object is cloned. After cloning is performed, there are two copies of the container object; both of them have references to the same contained object. This is called a shallow cloning because references are copied, not the objects. The clone() method of the Object class makes only shallow cloning, unless you code it otherwise. 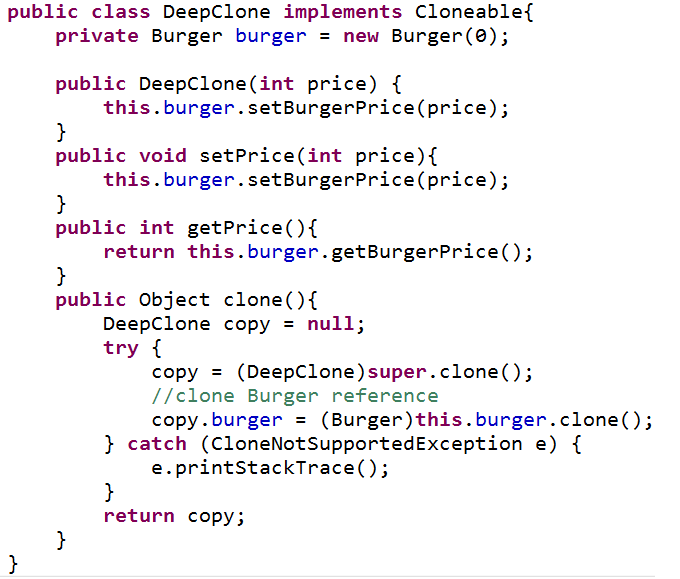 An object of the ShallowClone class is composed of an object of the Burger class. 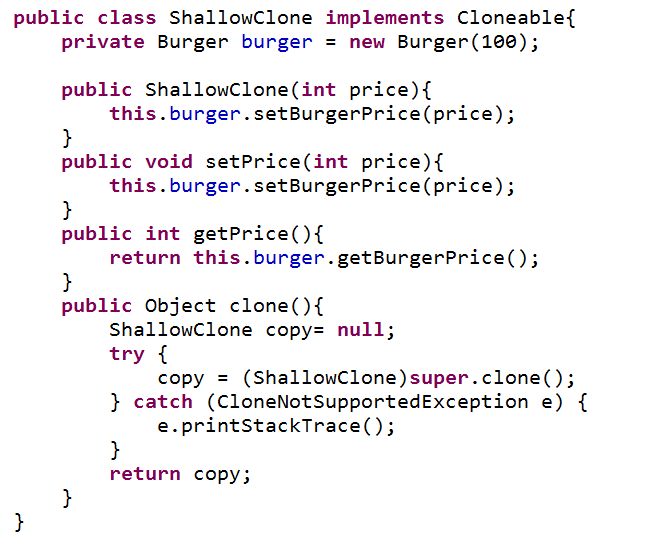 The code in the clone() method of the ShallowClone class is the same as for the clone() method of the Burger class. The difference lies in the type of instance variables that are used for the two classes. 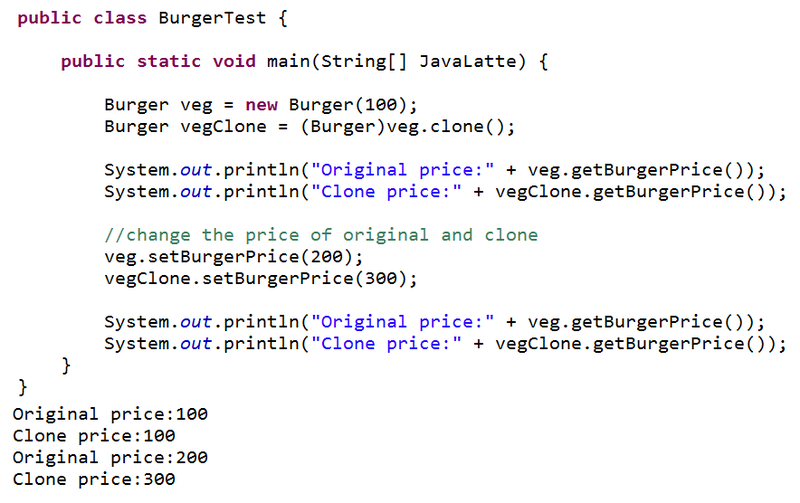 The Burger class has an instance variable of primitive type int, whereas the ShallowClone class has an instance variable of the reference type DoubleHolder. When the ShallowClone class calls the clone() method of the Object class (using super.clone()), it receives a shallow copy of itself. That is, it shares the Burger object used in its instance variable with its clone. 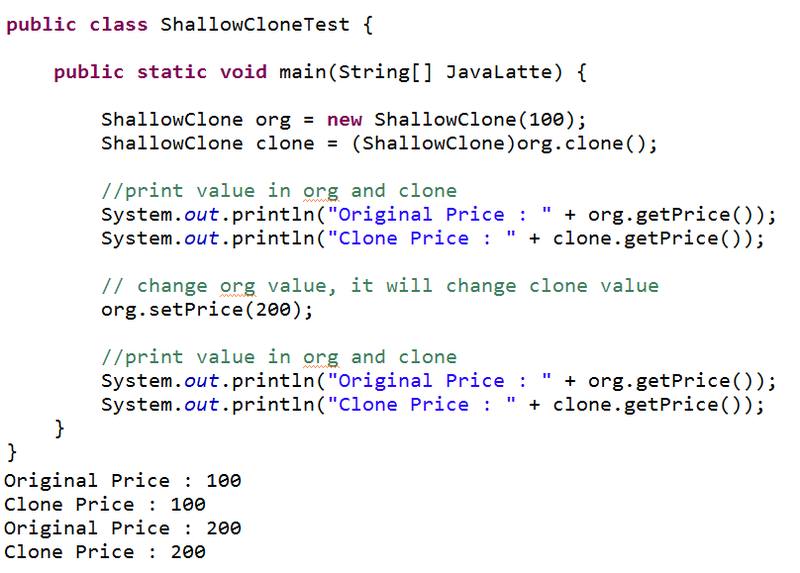 Following code test an object of the ShallowClone class and its clone. The output shows that after you make a clone, changing the value through the original object also changes the value in the cloned object. 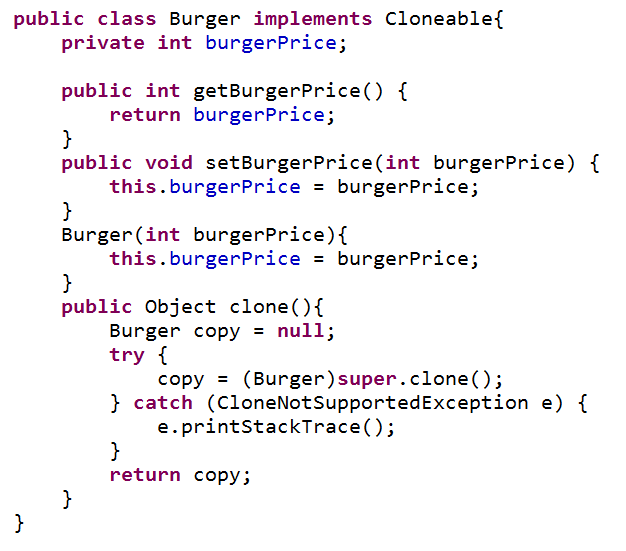 This is so because the ShallowClone object stores the value in another object of the Burger class, which is shared by both the cloned and the original objects. When the contained objects are copied rather than their references during cloning of a compound object, it is called deep cloning. 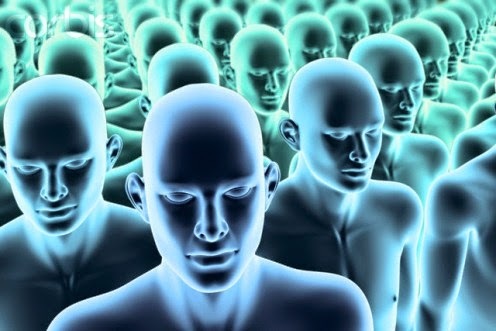 You must clone all the objects referenced by all reference variables of an object to get a deep cloning. A compound object may have multiple levels of chaining of contained objects. For example, the container object may have a reference of another contained object, which in turn has a reference of another contained object and so on. Whether you will be able to perform a deep cloning of a compound object depends on many factors. If you have a reference of a contained object, it may not support cloning and in that case, you have to be content with shallow cloning. You may have a reference of a contained object, which itself is a compound object. However, the contained object supports only shallow cloning, and in that case again, you will have to be content with shallow cloning. In a deep cloning, you need to clone all objects referenced by all reference instance variables of an object. You must perform a shallow cloning before you can perform a deep cloning. The shallow cloning is performed by calling the clone() method of the Object class. Then you will need to write code to clone all reference instance variables. 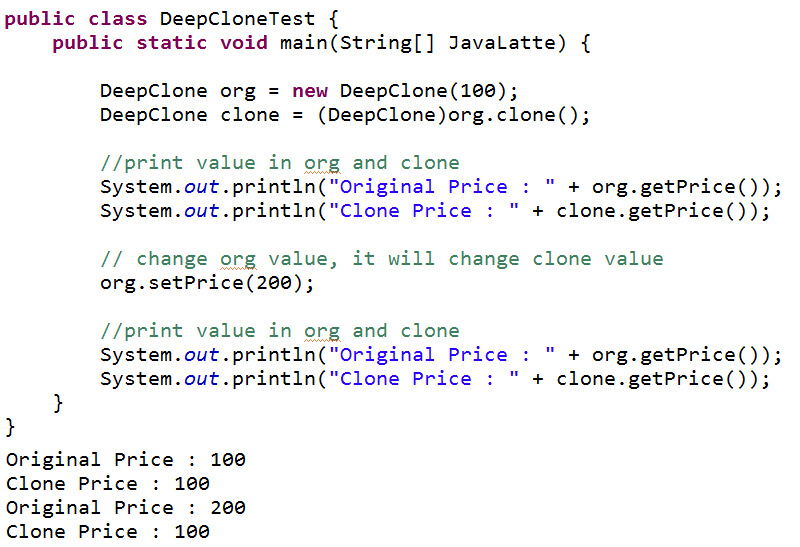 If you compare the code in the clone() method of the ShallowClone and DeepClone classes, you will find that for deep cloning you had to write only one extra line of code. Using the clone() method of the Object class is not the only way to make a clone of an object. You can use other methods to clone an object. You may provide a copy constructor, which accepts an object of the same class and creates a clone of that object. You may provide a factory method in your class, which may accept an object and returns its clone. Another way to clone an object is to serialize it and then deserialized it. They do not rely on a risk-prone extralinguistic object creation mechanism Where as in clonealbe, In order for implementing the Cloneable interface to have any effect on a class, it and all of its superclasses must obey a fairly complex, unenforceable, and largely undocumented protocol. The resulting mechanism is extralinguistic: It creates an object without calling a constructor. They do not conflict with the proper use of final fields where in cloneable, If a class is not final, `clone` has to return the most derived class for which it was called. That can't work with a constructor, because `clone` doesn't know which one to call. If a class is final, it can't have any subclasses, so there's no danger in calling its constructor when cloning. They do not require the client to catch an unnecessary checked exception, where it require clonealbe require the client to handle the exception. They provide a statically typed object to the client.